2013, I have decided, is my year of celebration. And if ever there was a time to celebrate, now is the time. We’re getting ready to celebrate sacrifice, forgiveness, grace and the extraordinary hope of new life, motivated by a love that pales even the strongest human love into dull grey. Forget bunnies and chicks – this year, my friends, I want to celebrate Easter with a joyful exuberance befitting of its life-changing significance. I have come up with a few things. I’m not going with everything I brainstormed at the start of the year because, mindful of my latter point, it would be counter-productive to stress myself (and my family) out with too many little details. We’ve already started playing out short sections of the Easter story. My 1-year-old is riveted, wanting to listen and join in when she can. My 3-year-old is deeply moved (and so am I – man, I’m going to be a wreck when he leaves home). He’s asking questions and responding to the story in powerful ways. I’ve just painted a hotch-potch collection of little Easter figures. There’s Jesus, the three women who stayed close, two angels, two criminals crucified alongside him, and two Roman soldiers. (These were my low point. Not so much soldiers as grey-haired, tabard-wearing nursery teachers.) OK, I’m not an artist. But we’ll use these figures – plus some rough crosses my lovely Dad helped me make – to act out the Easter story in our home over the next couple of weeks. I have seven plastic eggs, and will invite the kids to open one each day from Palm Sunday onwards, so we can count down to Easter Sunday together. 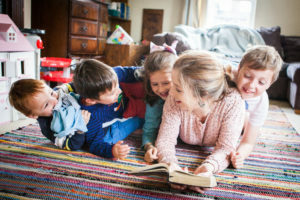 In each will be two small chocolate eggs – one each – as well as a clue to the day’s activity – for example: making Easter cards, hunting for an Easter sticker book, making chocolate Easter egg nests. 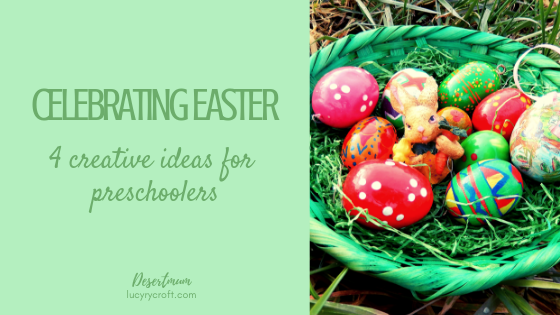 I hope that this build-up helps the kids to realise what a special day Easter is – and that the individual activities will help encourage conversation about what it all means. I hope we’ll make resurrection cookies on Easter Saturday. This is SUCH a cool idea you just have to take a look – I won’t up my word count unnecessarily. In future years I’d like to explore how we can use Easter as a time for giving. If we’re celebrating new life and new hope, then it’d be great to consider ways we could give a new start to people in our community. I’m not talking huge presents for my own kids, who already have far too much, but perhaps giving away some of our stuff to those who are desperate for it, or making something personal for a friend who’s having a rough time, or writing letters or cards to encourage others, or giving money to local charities. A small start this year is that we’ve grabbed a few real Easter eggs and will be giving them to Mister’s little friends – a kind of Easter/farewell present, as we prepare to leave York.